4 Bedroom Detached House For Sale in Sheffield for Guide Price £525,000. 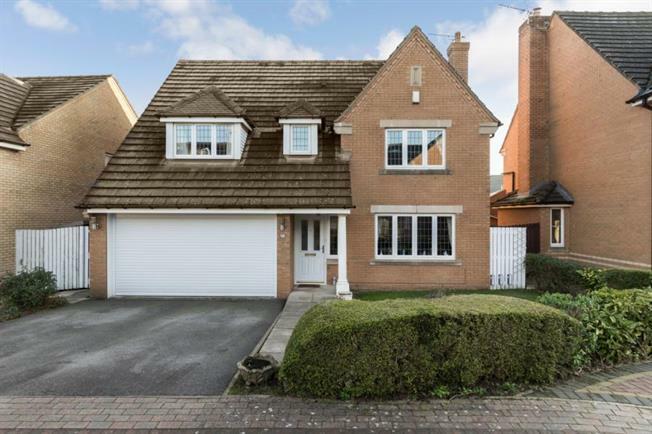 An excellent opportunity has arisen to acquire this well decorated four double bedroom detached family home with an integrated double garage situated within the popular Lodgemoor estate. The property which is located within a quiet cul de sac is pleasantly decorated throughout, well maintained and has two reception rooms, garden room overlooking the attractive enclosed rear garden and four double bedrooms with an en-suite, and benefits from gas central heating, uPVC double glazing, high speed fibre optic broadband, double driveway, integrated double garage and both front and back garden. The loft and walls to the property are cavity insulated. Accommodation in brief comprises: entrance hall with cloakroom / WC and high gloss walnut real wooden flooring flowing through both the lounge and dining room. The front facing lounge has an attractive feature fire surround with living flame gas fire and double door access to the dining room which has French style doors leading out into the rear garden. The family breakfast kitchen with the garden room must be viewed in order to fully appreciate. The kitchen has a range of wall and base units with built in appliances such as a four burner gas hob, with extractor hood, electric double oven, dishwasher, fridge freezer and breakfast bar area. The floor is tiled and the kitchen has access to the utility area with space for an automatic washing machine and a tumble dryer, a door leading to the under stairs cupboard and a door providing access to the integrated garage. Open plan from the breakfast area is the garden room providing further reception space and French style doors lead out to the beautiful enclosed rear garden. First floor has four well proportioned double bedrooms with built in wardrobes, family bathroom and provided access to the loft which provides great space and has potential to be converted into additional living space (subject to necessary consents). A spacious front facing master bedroom leads into the en-suite facility with a double shower enclosure, built in wardrobes and a Dorma window. The three further double bedrooms have built in wardrobes providing ample storage. The family bathroom has a three piece suite in white that includes a wash hand basin, low flush WC, bath as well as a separate double shower enclosure having main shower within, tiling to the splash backs and floor, along with extractor fan. Outside. : To the front of the property is a hedged garden with lovely rose shrubs and perennials. The double driveway leads to the integral double garage that has an electric up and over door, power and lighting. The rear Garden can be accessed by the side gate and is lawned with planted rose shrubs, perennials and a flagged sitting area. Lodgemoor is a most popular and sought after suburb of Sheffield, approximately 2-3 miles to the Hospitals, university and popular private ( Sheffield girls, birkdale, Westbourne) and comprehensive schools (Tapton, King Edwards) and is the catchment to the Hallam Primary School. The Lodgemoor estate has communal well maintained gardens, train park with children play equipment, Redmires lodge nursery and is close to the Redmires reservoirs and open countryside. It also benefits from a host of excellent amenities such as the popular Hallamshire Golf club and doctors surgery. Early viewing is highly recommended to avoid disappointment.